This is about a guy (and a girl he sneakily recruited) who have lived through the past seven Maine winters, in two different average older houses, using what most people would consider “rather little heat”. What does that mean? Well, last winter the “warm” area of our house averaged 54.6°F (the previous winters averaged 54.7º, 52.3º, 52° and 56°). Our heating energy use consists of about one cord of firewood ( < $250-350, depending), about $100 worth of electric heat, and various low-tech efforts at reclaiming heat that would otherwise go down the drain, out the window, or otherwise be wasted. The initial motivation for this experiment was four-fold: (1) Yankee stinginess, as heating oil topped $4/gallon in 2008, (2) environmental inclinations, as I realized that in winter New Englanders burn even more oil for heat than gas in their cars, (3) curiosity, as I wondered how people lived in New England in the old days without tropical indoor temperatures, and wondered if they could do so again, and (4) boredom, alleviated by amateur heat-reclamation engineering projects. Now, though, it’s just become a way of life. In the winter of 08/09 we were in a 140-year-old city house with old steam heat. We made it through with only 59 days of furnace use, and those with the thermostat rarely set any higher than 60ºF. We used about a third the oil of previous winters at the same house. 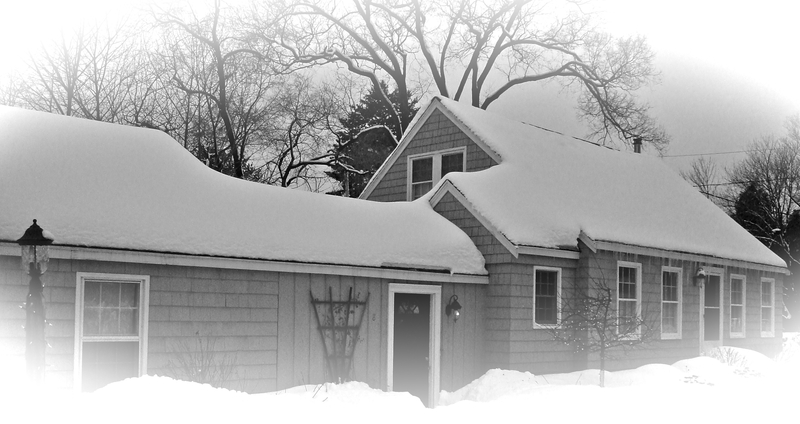 For the winter of 09/10, we moved to an average, marginally-insulated 1940’s suburban cape with no furnace, no radiators, no thermostat– basically, no heating system. At the start of that first winter we had just a couple of small electric space heaters and an electric blanket. After Christmas, we put in a tiny wood stove. We grew accustomed to living with indoor temps in the 50’s– the bedroom was often in the 40’s, the kitchen was sometimes above 60. We used less than $100 of electricity for warmth over the winter, and less than a cord of firewood. We shut the stove down altogether on March 8th. The winter of ’10/’11 we continued heating with wood at a rate of about one cord per year, supplemented by tidbits of electric spot-heating. Our total annual heating expenses are now about half the amount of an average Maine LIHEAP grant, and about 15% of what an average oil-burning Maine household spends each winter. For the winters of ’11, ’12, and ’13, we just kept on keeping on. We still used about 1 cord of wood per winter, but paid for none of it (salvaged from various friends who took down trees, as well as our own invasive tree eradication project in the back yard.) In the winter of ’14 we had to break down and pay for a cord of wood. Shameful. Now, heading into the winter of ’15/’16, the simmering tension over winter heating has finally boiled over. When the natural gas company dropped a new pipeline right in front of the house, one person could not longer hold out against the other’s desire for a “real” heating system. So, some radiators and thermostats are going in… stay tuned to see how much use they actually get. I’m still interested in the central question of how to dismantle the Home-Heating Industrial Complex. "So easy is it, though many housekeepers doubt it, to establish new and better customs in the place of the old." Of a love or a season?" "You see, Rodya, to my thinking, the great thing for getting on in the world is always to keep to the seasons; if you don't insist on having asparagus in January, you keep your money in your purse." Enter your email address to subscribe to Cold House Journal.